India celebrates Saraswati on Basant Panchami through the worship and adoration of the Goddess of Learning and the Patron of the Creative arts but few care to remember the river, the so-called mythical river, that serves as a critical bridge of between the India of today and the ancient civilisation that serves as the foundation of the modern nation. This link is very clearly established in Michel Danino's seminal book, The Lost River - On the Trail of the Saraswati, and also explained quite well in his lecture delivered to the students of IIT Madras in 1999. Many more scholarly references to the existence of this river are given in the book but unfortunately the politics of contemporary historical studies continues to deny this important link to India's past. If you think for a minute about a very serious problem in the popular, and politically correct, narrative of Indian history, then the acceptability of the solution offered by the presence of the Saraswati River is immediately apparent. We have a civilisation that has created a huge body of literature, the Vedas -- whose antiquity and authenticity is unchallenged but there is no physical evidence of these very scholarly people. No cities, no settlements, no artifacts, no tools. Just their literature that has survived almost unchanged down generations of history. In parallel we also have the Harappan civilisation ( also known as the Indus Valley Civilisation ) where we have extensive archaeological relics -- cities, tools, artifacts, seals but we have no clue about their literature or what happened to the people after the cities fell into disuse. Both these civilisations happened to be co-located in the same region of North West India (and current Pakistan) and are nearly synchronous in time. So what stops us from recognizing that they are one and the same ? Colonial historians who refused to believe that ancient Indian society was sophisticated enough to create pieces of literature on par with or superior to contemporary European literature have created the myth of the Aryan Invasion Theory. This theory, that is widely taught in Indian schools, says that the Vedas's were created by the Aryans who flooded into India from Europe and Central Asia and laid the foundations of the modern India society. The people of the Harappan civilisation, perhaps the original people of India, were either totally destroyed or moved south to form the core of Dravidian population that is found in South India. The Aryan Invasion Theory is full of holes, the principal one being the absence of any Vedic type literature in any place, starting from Europe and Central Asia, through which these so called invaders passed before entering India. It is as if the Vedic wisdom dawned on them only after they crossed the Indus ! Also the presence of images and pictures of horses in Bhimbetka ( near Bhopal, Madhya Pradesh ) on the walls of rock shelters that have been dated as ancient as 10,000 BC contradicts the assertion that horses were brought to India by Aryans. While the Aryan Invasion Theory has been widely discredited, what we need is a clinching evidence that links the two great civilisations of North West India and this is provided by the Saraswati River. Almost every piece of Vedic literature refers to the Saraswati river as the biggest and mightiest river that nourished each and every aspect of the Vedic civilisation. Why would the ancients lie about the existence of river ? It is also said that because of, what we would now refer to as, climate change the great river finally died out but is still remembered and venerated as a mythical river. 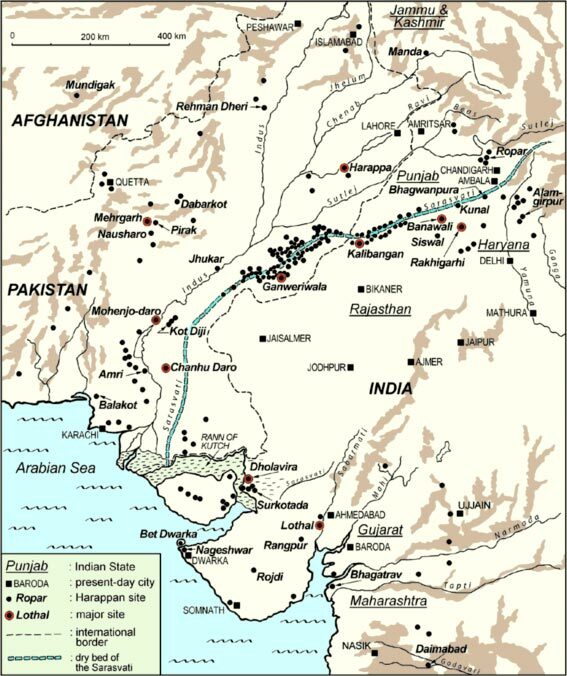 In searching for this river in western India, archaeologists and hydrologists have identified the Ghaggar River located between the West-flowing Sutlej and the East-flowing Yamuna as a possible candidate. In fact Ghaggar has a tributary called the Sarsuti that carries water during the rainy season and dries up later. Tracking the now dried up bed of the Ghaggar, hydrologists have determined that it used to flow like the Sutlej towards the Indus but instead of reaching the Indus, the now-dry bed turns south and flows parallel to the Indus and reaches the Arabian sea between the current Indus Delta and the Rann of Kutch. And here comes the clincher of an evidence. Our history books refer to Mohenjodaro and Harappa as the two major cities of the Indus Valley Civilisation with Kalibangan, in Haryana and Lothal in Gujarat as the two edges. However, recent studies have revealed hundreds of settlements with the same characteristics of this civilisation across many parts of North West India and if these are plotted on a map ( taken from the article referred to previously )-- the majority of them lie clustered along the dry bed of the Ghaggar river ! So that is it. The Harappan civilisation is actually the Saraswati civilisation ( or the Sindhu-Saraswati civilisation ) that is synonymous with the Vedic civilisation that we in India are all familiar with today ! And to cement things even further strong similarities have been noticed between the symbols of the Harappan seals and the Brahmi script found on Ashokan edicts, the oldest surviving physical remnants of the Vedic civilisation of India. So what happened to the Harappans ? The answer is evident if you observe the flow of the Sutlej and Yamuna. If you notice carefully, both the Yamuna and the Sutlej both start of flowing towards the West, even today. But unlike the Sutlej, the Yamuna makes a turn and starts flowing East. The Saraswati was between the two of them. Now it is possible that all three could have flowed South West until some tectonic movement or an earthquake raised the ground level. Imaging a hump rising slowly. The Sutlej swings Westward to avoid the rising ground and reaches the Indus and the Arabian Sea. The Yamuna swings Southward and then turns Eastward to reach the Ganga and the Bay of Bengal. The Saraswati, "poor girl", has nowhere to flow and gets stuck in the dry desert sand -- and worse, its headwaters are captured by the Sutlej in the West and the Yamuna in the East. So the Saraswati dries up and the Harappan people on its banks are left without water and start migrating towards the East, where the land is more fertile and there is more water, towards the Yamuna and the Ganga and become known as the Gangetic civilisation based on the Vedas that we know today. And the Saraswati ? She continues to be remembered in a thousand stories and myths as the great river that flourished during Vedic times -- and worshiped today, as the Goddess of Learning and the Patron of Creative Arts. Many people are celebrating Saraswati Puja today, we will celebrate it tomorrow. This is a thought provoking post and poses valid questions. There are various archaeological and geological data points that need to be considered to build up a demystified narrative of the Indian people. I guess we will all agree that any theory ideally would need to incorporate all available data sets into it and be flexible enough to rationally look at newly discovered data sets to test currently held positions. Even if there are no new data sets discovered generally accepted theories would do well if they can withstand the test of scrutiny and re-interpretation. If the Aryan invasion theory has a colonial political motivation, the son of soil theory also has a ultra-nationalist motivation. If the former ignores the challenge of the break in the narrative the later ignores the data like the genome project output. 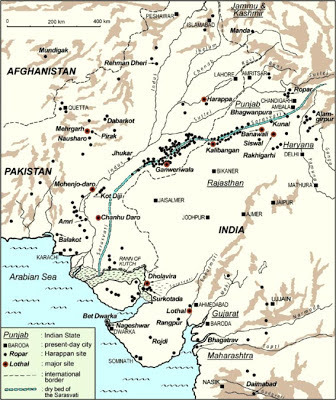 Theory of an influx from over the Karakoram and Hindukush can co-exist with the theory of continuity from the Indus Valley. Both theories may need to be modified, thrown away, or merged. Transition from the Harappan script on earthen tablets to the Devanagari script on the palm leaf is quite a transformation. The Vedic-Zoroastrian linkages are too strong to ignore. It would, in my belief, not do any good to ignore the Out-of-Africa theory that seems to find evidence in our blood and genes. I don't think we will be ever be able to solve the puzzle if we do not dispassionately look at the data and are suspicious of the (political / racial / whatever) intent of each theory. I know I am also subject to the influence of such bias. But the truth is always more comfortable. The existence of the Saraswati river in the form of the dry river bed of the Ghaggar and the Harappan settlements on the bank is quite a hard physical evidence. I liked very much your blog-post. Do visit the "Out-of-India - From Theory to Truth" on Bharat-Rakshak Forum. It is one of the biggest resource for all material concerned with the subject of AIT Myth.